Walking in Tenerife - now there's a novelty! Yet more and more Brits are realising that the diverse and breathtaking scenery of this sub-tropical island offers much in the way of hiking trails and coastal walks. The beauty of it is, you can choose mountain routes if you're quite fit and want to test your stamina, or stroll along the coast for a more leisurely experience. It's possible to see sights that most residents haven't set eyes on...and you're not tied to an itinerary. If you happen across a picturesque restaurant, you can take a break and some refreshment, lingering as long as you want. The best way to be truly independant when walking in Tenerife is, paradoxically, to hire a car. That way, you don't have to rely on buses, which, although generally providing an excellent service, don't cover the more out-of-the-way places you'll be going. When walking in Tenerife, it's possible to explore forests, steep ravines, volcanic, "moonscape" areas and awe-inspiring coastlines and, quite often, the areas you pass through will be totally deserted. You'll have the place all to yourself. This, of course, is an essential resource during your walk. Take plenty along with you, as you'll be surprised how thirsty you get. Obviously, you can top up in any bars you come across, but there are also places called zonas recreativas, where you'll find drinking fountains dispensing pure spring water. It is advisable to wear clothing in layers. The temperature can change dramatically, or, if walking at altitude, you could be suddenly enveloped by a thick, cold, damp mist. Having the layers helps you to adapt what you are wearing to the environment. You are most emphatically advised to use these two items. Some walks can provide little or no shade and acute sunburn is a distinct possibility. This is pretty much a matter of common sense. For mountainous regions or the pine forests, especially in winter, you need proper hiking boots. Coastal walks are a little easier on the feet and you'll get by with a good pair of sandals. Here are a few suggestions for walking in Tenerife, ranging from the reasonably easy to quite arduous. 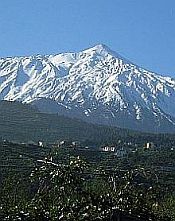 Explore the area around Mount Teide with this walk leading to the summit of one of its smaller neighbours. Fantastic views. An easy walk. Another mountain next to Teide, rising to about 9000 feet. This is by no means for amateur hikers, as the air becomes thinner at such high altitudes and the going gets quite tough. More amazing views. This is the familiar table-topped mountain near Los Cristianos - a famous landmark. A moderately easy walk, offering panoramic views from the summit. You begin at Las Lajas and descend continuously towards the village of Ifonche. This is a fairly easy walk...unless you do it in the other direction! 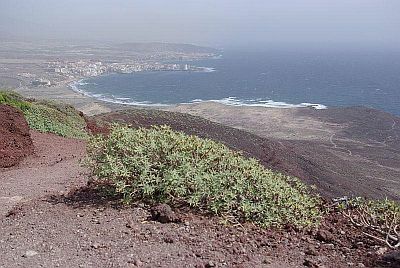 This picturesque walk goes from Los Cristianos to Las Galletas and takes in two nature reserves. 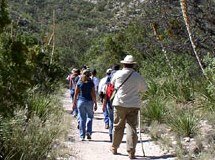 There are various walks starting from Arona, including one which takes you through the Barranco del Infierno. 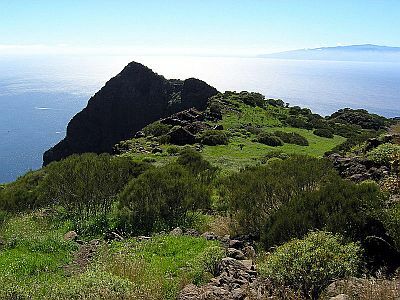 There are a number of walks either starting or ending at Tenerife's highest village, to suit various levels of walking ability. A very popular walk that follows in the footsteps of old goatherders and can, if you wish, include a climb of the Roque del Imoque, at just over 3,600 feet. A walk through the volcanic Black Mountains, including a stunning view of the Volcan de Garachico, the volcano whose eruption destroyed Garachico in 1706. Of course, the list above is only a handful of suggestions for walking in Tenerife. For many more ideas, why not purchase this book, containing 45 routes of all distances and difficulty levels. It comes complete with photographs and clear contour mapping.